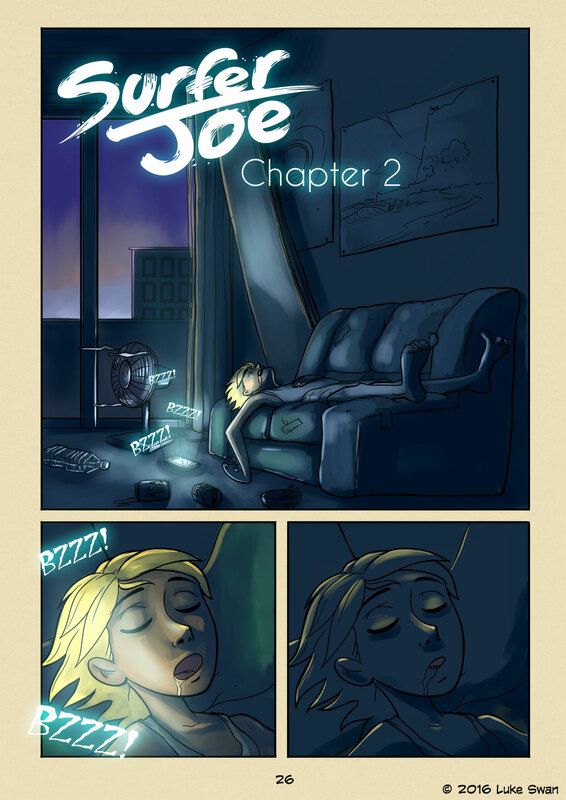 Early Rise (#026) | Web comic "Surfer Joe"
Sendai in the summer… the sun rises stupid early. And by early, I mean like 4 AM. There’s no daylight savings time here, which can be nice. There is no awkward adjusting of your internal clock you have to do twice a year, so that’s one thing at least. Of course in the winter it’s dark out by 4:30-5:00 PM. It can be kinda depressing to get off of your 9-5 and it already is dark. Could be worse though, it could be Alaska. Makes me curious if there is surfing in Alaska. Turns out there is. Looks beautiful, and ridiculously cold. Gonna have to put it on my bucket list, which at this point has gotten so large it would take me two lifetimes to cross everything off of it… But I digress. I live about 40 minutes from the beach, but can make it there in 20 with the early morning traffic(or no traffic, rather). Still, it’s long enough that it’s pretty disappointing when you roll up to the beach to find nothing but mush. When I was still at the beginning of my surfing life, I had that grom-like optimism. I would paddle out into anything. And waking up early was a breeze, even at 30 year old. Now, 6 years in I find myself becoming a wave snob. I usually wait for one of the locals to post pics on either Facebook or Line, and if it looks good I head out. Facebook seems to be really popular among the surfers here. I think it’s been catching on recently. They mostly use it to post surf pics, or report on wave conditions. It’s really nice. I find it’s also a good way to meet people, and there is less awkward introductions in the water. You can come in knowing who the people are, and they know you. And we can get down to playing in the waves. The surfers of Sendai are great people, and I feel honored to be taken in as one of their own. Please take a moment to vote for us on Topwebcomics.com! With enough votes we can reach the front page of the site, which would help us spread the word. We are grateful for everyone’s love and support, and work hard everyday to make a story the surfers of Sendai can be proud of.